The Spitzer Space Telescope, using infrared photography captures massive stars-to-be on the verge of erupting to life in the Triffid Nebula. SAN DIEGO -- A new image of a familiar stellar nursery peeks inside the incubators to provide a colorful glimpse of unborn stars. The scene is the Trifid Nebula, a cloud of gas and dust about 5,400 light-years away in the constellation Sagittarius. It has been photographed before, most famously by the Hubble Space Telescope. The new image, from the Spitzer Space Telescope, uses infrared photography to peer through the cloud in search of heat-emitting sources inside. It captures massive stars-to-be on the verge of erupting to life. It was released here Wednesday at a meeting of the American Astronomical Society. "Massive stars develop in very dark regions so quickly that it is hard to catch them forming," said Jeonghee Rho of Caltech's Spitzer Science Center, which operates the telescope for NASA. 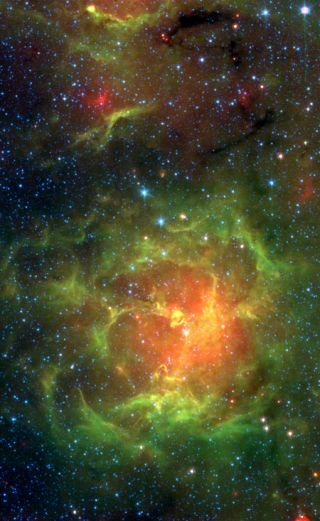 "With Spitzer, it's like having an ultrasound for stars. We can see into dust cocoons and visualize how many embryos are in each one of them." The telescope focused on four knots of dust that astronomers did not expect were yet ripe for incubating stars. Surprisingly, warm stellar embryos are developing in each one. "Spitzer can see the material from the dark cores falling onto the surfaces of the embryonic stars, because the material gets hotter as gravity draws it in," said the center's William Reach. In all, the observations reveal 30 embryos of massive stars and 120 newborn smaller stars. Researchers gleaned new information about what goes on inside an individual knot of star formation. "In the cores with multiple embryos, we are seeing that the most massive and brightest of the bunch is near the center," said Bertrand Lefloch of the Observatoire de Grenoble, in France. "This implies that the developing stars are competing for materials, and that the embryo with the most material will grow to be the largest star." Other studies have found that most of the galaxy's star formation occurs in dense regions similar to the Trifid Nebula. The process is at times wild, with smaller stars frequently being gravitationally booted out of the region. Our Sun is thought to have formed in such an area, some 4.6 billion years ago, and then been launched out its present and rather lonely position.